In 2011, I rescued a dog in the Memorial area of Houston, Texas. She was wearing a collar without tags, was not micro-chipped, and had been extremely neglected. I have rescued many dogs in the past and have always been able to reunite them with their original owner. In this case, after consultation with my Veterinarian, I decided that “Tori” (the name I gave her), should have a new home. One which she deserved. One that would return the love that she so freely and incessantly shares with everyone she meets. After a two month search for the best rescue and adoption agency, I found Noah’s Ark Bayou Sanctuary (NABS). I visited N.A.B.S., inspected their facilities, and asked detailed questions regarding their methods, procedures, adoption criteria. Upon leaving, I knew I had found the right temporary home for Tori. Within a month, Tori (see her picture in the header above) had her first to Petco and immediately attracted interest. Within three months, she had found a permanent home with a wonderful family. She finally found the home she deserves, all due to the care and hard work on the part of N.A.B.S. In short, I strongly recommend Noah’s Ark Bayou Sanctuary without reservation. Seeing Tori with her family made it worth every effort and every penny! Thank you N.A.B.S. for all that you do. My husband and I have been fairly consistently giving the family Christmas party for about the last 15 years. Each year, it has become more and more of a production with tons of food, Santa, etc. This year my family members decided to make a donation to a charity of our choice to thank Mark and me for the party. The result represents a collection from all of them. I can't think of a charity more deserving than yours, so put it to good use! God bless you and the tireless work you do every minute of the day and night. Happy New Year! Remember the wheelchair we raised funds for and bought for Maggie a few years ago? She was one of our rescues who lost the use of her back legs. 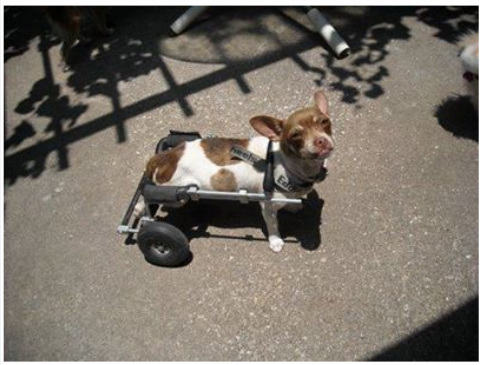 After Maggie passed away, her adoptive family returned the wheelchair to us so Ginger could use it! Isn't she precious?